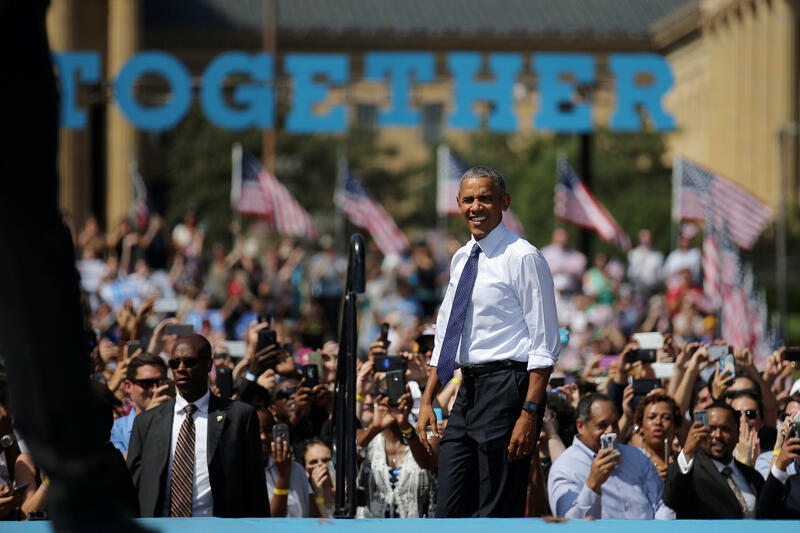 Obama's enthusiastic pitch for Clinton: "This is not me going through the motions"
An energetic President Obama took the stage in Philadelphia on Tuesday with an enthusiastic pitch for Hillary Clinton. He praised Clinton at length, in the same terms he’s used as the past, reiterating his assertion that “there has never been a man or a woman who has been more qualified to serve as our president,” and praising her work ethic and her judgment. But one of the main arguments for Clinton is the argument for Mr. Obama’s own legacy, and Clinton is the clear choice for him to see it carried on. “By so many measures, America is stronger and more prosperous than when we started out,” he told the adoring crowd. He went on to point out “we made marriage equality a reality in all 50 states. We brought more of our troops home to their families. We delivered justice to Osama bin Laden​. Through diplomacy rather than war, we shut down Iran’s nuclear program,” and he mentioned normalized relations with Cuba and the climate change deal reached in Paris. “That’s what we’ve done,” he said. Donald Trump, the president said, offers a “dark, pessimistic vision,” where we turn away from the world, the president said. “This isn’t Abraham Lincoln’s Republican party,” he opined. The president accused Trump of fanning resentment and hate. Does Clinton's "basket of deplorables" remark help or hurt her campaign? The president derided Trump’s efforts to win over working class Americans, asking the crowd, “Really, this is the guy you want to be championing working people? This guy who’s spent 70 years on this earth showing no concern for working people. This guy’s suddenly gonna be your champion?” he asked, eliciting a chorus of “no” from the crowd.